Browse: Home / 2013 / February / What’s your favorite flogger? I just saw the most amazing flogger by Pipedreams. It is part of the Fetish Fantasy Pink Line. I can’t wait to buy one. 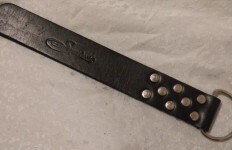 Made from suede and two feet long, it should be a wonderful tool for our play time.